The Wasatch Front is beautiful in the winter, but it sure can get cold. When the weather in our valley brings you to your knees, you have two choices: A. hope that global warming speeds up; or B. hop on a 70-minute flight south and find yourself in 70-degree-plus weather in Scottsdale, Ariz.
With 360 sunny days each year, this Southwestern town is full of golf courses, fine dining, resorts that are destinations unto themselves, and an Old Town area filled with bars, art galleries, shops and restaurants. Once you’ve checked into the Fairmont Scottsdale Princess (7575 E. Princess Drive, 480-585-4848, ScottsdalePrincess.com), there’s no reason to leave. The 65-acre property sitting in a beautiful desert landscape is like its own village, with four restaurants, a 44,000-square-foot spa, multiple pools and two Tournament Players Club golf courses. You can explore the trails and cactus garden and even go fishing in the on-property lagoon. Those looking for more of a boutique experience will want to try Hotel Indigo (4415 N. Civic Center Plaza, 480-941-9400, HotelIndigo.com), which sits in the heart of Old Town and features a rooftop pool. It’s an easy walk to the surrounding downtown area, with one street featuring bars, another focusing on art galleries, and one loaded with restaurants. If you’d like to live on the “suite” side, accommodations with kitchens are also available where you can choose to simplify the amenities in favor of space at Residence Inn (17011 N. Scottsdale Road, 480-563-4120, Marriott.com). As expected, Southwestern and Mexican cooking are the specialties here, with many local chefs putting new twists on traditional dishes. Roaring Fork (4800 N. Scottsdale Road, 480-947-0795, RoaringFork.com), features award-winning fare, all cooked over a wood fire; try the green pork chili, glazed duck or a braised short rib that falls off the bone. The steaks have that smoky taste you associate with a backyard grill; pair it with a side of green chile mac & cheese, which, like the Hulk, is both green and powerful. Start your night at the Fairmont Scottsdale Princess’ La Hacienda (480-585-4848, ext. 7320) with a prickly pear margarita and petite lobster tacos before enjoying unique main courses, such as a pistachio mole chicken topped with pomegranates. Saving room for the flaming coffees—or bebidas de fuego—for dessert is a must. They’re a work of performance art, presented table-side as a waiter tosses a mixture of cinnamon and sugar into a cup full of burning tequila, sending flames several feet high. If the warm weather puts you in more of a tropical mood, try Tommy Bahama (15205 N. Kierland Blvd., 480-607-3388, TommyBahama.com). While Tommy Bahama is known primarily as a clothing brand, there are a few locations where an island-themed restaurant adjoins the retail store. Highlights include a large selection of rums, as well as island inspired dishes like macadamia nut-encrusted goat cheese, ahi poke Napoleon, crab bisque and coconut shrimp made fresh and soaked in coconut milk. Don’t leave without trying the surprising light and airy piña colada cake. 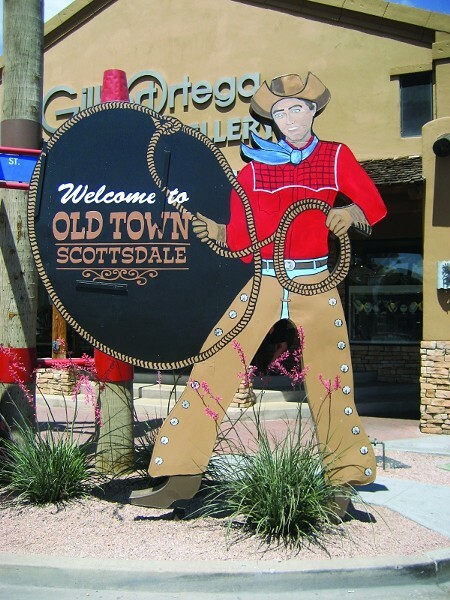 After dinner, stop by the Rusty Spur Saloon (7245 E. Main, 480-425-7787, RustySpurSaloon.com), an old throwback to Scottsdale’s cowboy era that has been serving up cold ones for more than 60 years. John Wayne and Clint Eastwood have hung out there; what more do you need to know? Follow the tradition of writing a note on a dollar bill and pinning it to the wall alongside thousands of others. If there’s one reason to stop relaxing in the sun, it’s to go indoors to one of the many highly rated spas, where you can relax even more. One of the area standouts is the Fairmont Scottsdale Princess’ Willow Stream Spa, featuring excellent treatments to go along with spa amenities like a rooftop pool, waterfall therapy pool, Swiss showers and the eucalyptus relaxation room. Another fun spa in Scottsdale is Bliss Spa at the W Hotel (7277 E. Camelback Road, 480-970-2100, WScottsdaleHotel.com), where guys can get the Manly Cure on for their hands or the Sole Man on their feet. For a little fun away from the pool, try some shooting at the Scottsdale Gun Club (14860 N. Northsight Blvd., 480-348-1111, ScottsdaleGunClub.com), or take a tour at Taliesin West (12621 N. Frank Lloyd Wright Blvd., 480-627-5340, FrankLloydWright.org), Frank Lloyd Wright’s winter home, studio and architectural campus constructed out of rocks and sand from the area. Any conversation about activities has to start with golf, since there are nearly 200 courses in the area. The Fairmont Scottsdale Princess features the adjacent TPC Scottsdale (17020 N. Hayden Road, 480-585-4334, TPC.com/tpc-scottsdale), two par-71 courses, including the Stadium Course, the site for an annual PGA event. The Fairmont features a golf concierge to set you up on one of the TPC courses or help plan your ultimate golf vacation at a variety of courses in the area. If you can’t head south in the next few weeks, no worries. The high season—and cold days in Salt Lake City—runs all the way through the spring, including Major League Baseball spring training for 15 teams in March.